Cedar Hills Crossing is Beaverton's largest shopping mall. They're currently expanding to include a variety of new shops and restaurants. One such establishment is the Bargarten Bavarian Social Haus (2905 SW Cedar Hills Blvd, Ste 140, Beaverton, OR). I arrived at the restaurant around noon on a weekday. The bar themed establishment was dimly lit with rows of communal tables in the main dining room. I took a smaller table out on the covered patio where I could enjoy the weather. 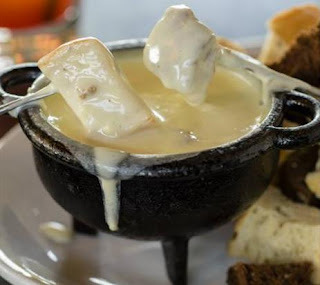 I started with the Fondue made with Swiss cheese, white wine & spices, served in a cast iron ramekin. One can have the molten cheese accompanied by assorted German breads, two soft pretzels, or chunks of smoked German bier sausages and assorted German breads. I chose the sausage and breads for $14.95. For my main course I had the Veal Schnitzel (breaded veal with Cremini mushrooms topped with paprika sauce and served with spätzle) for $18.95. I washed the meal down with a very tall Weizen glass of Hofbräu Hefeweizen for $4.95. I took photos of my meal, only to get home and realize the phone I used had not saved the photographs. Thus, I had to borrow this photo from Bargarten's own Facebook page. I asked them for permission to use the picture, but not hearing from them for four days I took their silence as tacit permission to use the photo. Fortunately, the fondue that you see is exactly what I got. It was warm, cheesy, and wonderful. The chunks of sausage were pleasantly spicy all by themselves and complimented the molten cheese superbly. The trick was to keep from filling up before my main course arrived. I wish I had a picture of the veal to show you. It was fried to a crispy golden brown, topped with large slices of Cremini mushrooms and a delectable brown paprika sauce/gravy. Accompanying the veal was an ample serving of spätzle peppered with herbs. The veal was deep-fried to a crispy golden brown, fork tender, and perfectly seasoned to deliver a series of thoroughly savory bites. The mushrooms were meaty with a nice earthy flavor and the piquant paprika sauce tied the mushrooms and veal together nicely. The meal's only deficit was with the spätzle. I was served a heaping mound of the rice sized pasta, but it wasn't seasoned well. The side, which served more as a garnish, needed garlic, cheese, salt, or something. As it was, it was just... kind of... there. As for the beer, or "bier" according to their menu, there's not much to be said. It was a standard Hefeweizen. The beer was light yellow in color and not too hoppy with a nice citrus undertone. All in all, I had a satisfying meal. I give Bargarten Bavarian Social Haus an 8.5 out of 10 stars. 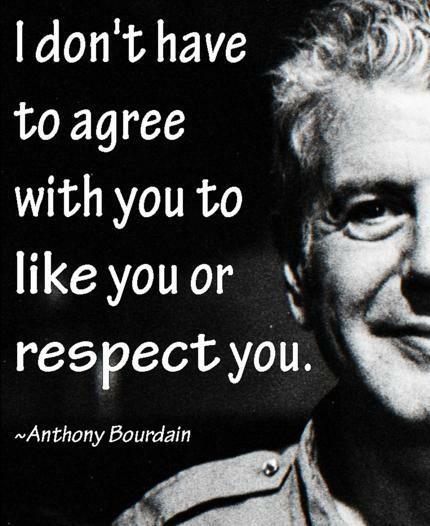 Friday morning I woke up to hear a teary eyed Joe Scarborough announce that; chef, author, and TV host; Anthony Bourdain died at the age of 61. I was floored. Not only was he dead but he had killed himself. You have to understand, he was not just another celebrity to me. He was an inspiration to me the way few authors have been. I remember reading Kitchen Confidential for the first time. Bourdain's description of food brought the foods to life. I could almost smell the duck confit as he described it on the page. 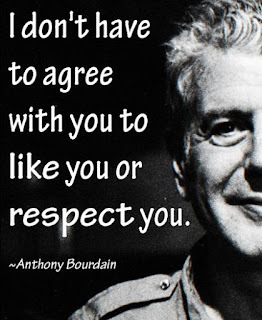 I've been accused of writing about food in his style, although probably not as well. Those who have watched his shows and/or read his books were privy to the perspective of a man who loved to live life. This was a man who could enjoy a five star gourmet meal, a hot dog off a food cart, or a meal with a family in the Ozarks. He loved it all. He ate with presidents and paupers alike and he treated them all with respect. The Berlin episode of his current series, Parts Unknown, aired shortly after his death. As he ate helpings of; currywurst, chicken sausage, smoked mashed potatoes, and punk rocker prepared roasted meat; I could see an emptiness in his lined weathered face. Sitting across from a young lady, who was explaining that Berlin's identity is about its future instead of its past, had he already decided to cut his own future short? I know he had drug issues, but I'll never understand how a man so full of life could choose to leave this world and his eleven year old daughter. I doubt I'll ever be able to make sense of the loss. Instead I need to remember the man as he was and what he meant to me.